Each star point is centered with a large Clear Swarovski faceted crystal, another Swarovski faceted crystal dangling in the center radiates lovely rainbows. The artistic detailing has a slight gothic effect and is very dramatic. The scene is the same on both sides. Hanging filament included. 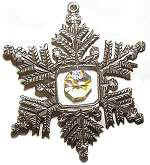 This crystal studded snowflake has a delicate lacy look. There are six segments each with 3 Clear Swarovski faceted crystals, another Swarovski faceted AB crystal dangling in the center radiates lovely rainbows. The scene is the same on both sides. Hanging filament included. 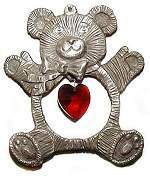 A darling pewter teddy Bear sports a dangling Ruby Swarovski faceted crystal heart. he has bright Clear crystal eyes and a warm smile on his face. He is certain to brighten any one's day! 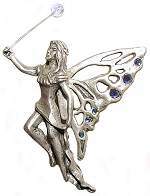 Very dainty butterfly winged fairy with wand. There are 6 medium and large Sapphire Swarovski faceted crystals on each side of the wings for a total of 24 crystals. Her wand is topped with a lovely faceted Aurora Borealis orb. Bring magic into your day with this beautiful Fairy Godmother! Hanging filament included. 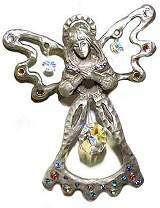 Dazzling Jeweled Angel has 4 large Aurora Borealis Swarovski faceted crystals and 35 large and smaller Sapphire and Clear crystals on both sides of this charming. Hanging filament included. 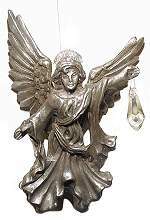 A charming Flying Angel with a large Aurora Borealis Halo of Swarovski faceted crystal, brings good news and blessings in the form of wonderful rainbows from the dangling tear drop crystal. Hanging filament included. A dramatic swooping Eagle carries his prize a large dangling Swarovski faceted crystal to his nest. The dangling crystal gently reflects the light. The scene is the same on both sides. Hanging filament included. Playful cat in country window scene. Lovely Tear Drop Aurora Borealis Swarovski faceted crystal draws everyone's attention to the rainbow lights. 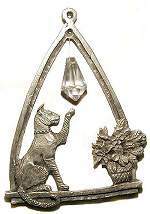 Great item for cat collectors. The scene is the same on both sides. Hanging filament included. 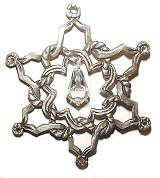 Lovely intertwined six-pointed Star of David, a symbol of spiritual devotion. Each point has a large Clear Swarovski faceted crystal and in the center dangles a beautiful Tear Drop crystal. The scene is the same on both sides. Hanging filament included. 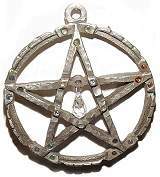 The magical pentacle star represents Man, who is the sacred number five, and is also a symbol of wealth and enterprise. Each point has 3 Swarovski faceted crystals in Sapphire, Emerald, Ruby, Carnelian and clear. 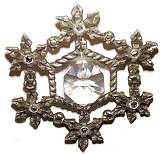 The center points are studded with Clear crystals. The scene is the same on both sides. Hanging filament included.